Sibyl La Grenade (née Sylvester) was born in Carriacou on May 15, 1924. She was brought to Grenada at the tender age of two weeks. She resided in St. David's with her parents. Her father, Cyril St. Bernard Sylvester, was the principal of St. David's Primary School, which she attended until she began her secondary school education at St. Joseph's Convent in St. George's. She successfully completed her Senior Cambridge in 1939. Based on her academic performance in these exams, she was awarded a scholarship to study nursing in England. Her protective father, reluctant for her to leave the island, encouraged her instead to begin teaching at a Catholic primary school in St. George's which was known at that time as "Mother Rose" School. She became actively involved in needlework and cookery, eventually rising to prominence in the field of home economics. Following her marriage to Allan La Grenade in 1949, Sybil put her teaching career on hold in order to raise her children. She raised 5 daughters and other children. When her youngest child began attending school, she returned to work teaching home economics at a primary school. She later became a school supervisor, training home economics teachers in Grenada. It was at this point in the late 1960's that she started de La Grenade Home Products, which has now evolved into de La Grenade Industries. The development of her business was interrupted in 1973 when she was forced to leave Grenada during political turmoil on the island. Her husband, Allan La Grenade, who was retired at the time continued her cottage industry. He had spent most of his life as Chief Education Officer of Grenada and later became the Cabinet Secretary prior to his retirement from the civil service. He then became the General Manager of the Grenada Breweries. Allan developed the de La Grenade Rum Punch formula that is still used today. During her ten-year residence outside Grenada, Sibyl pursued and completed a nursing degree at Brooklyn College. She also assisted her third daughter who was completing her medical training at Howard University. Sibyl returned to Grenada following her daughter’s graduation in 1983 and continued her work on the development of her business. De La Grenade Industries was registered as a limited liability company in 1984. She then began giving serious consideration to the expansion of the company into a commercial operation. 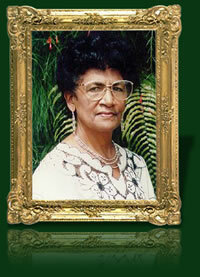 Despite the sudden death of her husband in 1989, she continued the commercialization thrust of the business and began construction of the factory in 1990. Even before the business was formally commercialized, some of the de La Grenade products received international recognition. In 1990, Monde Selection awarded La Grenade Liqueur a Gold Medal and Morne Délice Nutmeg Syrup a Grand Gold Medal. Sibyl La Grenade was suddenly and tragically killed in 1991 in a car accident in the United States.